Car Weigh-in begins at 9:00 and will run until 10:15. Please be here early so you can be sure your car weight is correct and make any adjustments if necessary. Your car must meet weight on our official scale or will be disqualified. The Race will start promptly at 10:30. Being a winner is easy and losing is sometimes hard. To be a good sportsman, you need to follow the rules, do your best and be satisfied with the results. Remember, the purpose of this event is to have fun. Weight: Race cars may weigh no more than five (5.0) ounces total weight as determined on the official scale during the inspection and registration periods. Wheels and Axles: The car shall roll on the wheels from the Awana kit, and the wheels shall turn about the axles from the kit. The axles shall be firmly affixed to the wood of the car body, but use of the pre-made ‘axle grooves’ is not required. It must be obvious to the judges that the wheels and the axles from the Awana kit are being used. Wheel Treatment: A light sanding to remove flaws is allowed as long as the wheel retains the original width and diameter from the original kit wheels. Wheel shape may not be altered from the original condition (i.e. rounded, beveled, cupped, etc.). Unacceptable Wheel/Axle Construction: The following may NOT be used in conjunction with the wheels or axles: washers, inserts, sleeves, bearings, etc. No material other than the wood block may touch the inside hub of the wheel. Weights and Attachments: Weights and attachments may be added to the car and will be considered part of the car for purposes of all measurements. Weights and attachments are considered to be any material on the car that is not provided in the kit. All weights and attachments must be securely fastened to the car. Lubricants: Lubricants must be dry at the time of inspection and racing. Lubricants may not foul the track, so all excess lubricant shall be wiped off. There will be a ‘pit area’ set up at the race for application of all lubricants. 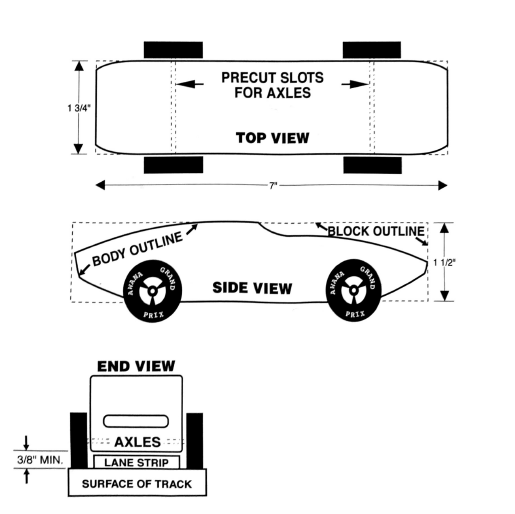 Staging: No part of the car is to extend over the top of the starting pin. Cars must be weighed and registered prior to race time and no later than 15 minutes before race time. Cars may be test driven until weighed in and registered. Following weigh in and registration, cars must be taken to the staging table. The car must remain on the table until the driver is called to the pit area to prepare to race. Driver, pit crew (parents), and race officials are the only people allowed to handle a race car. Drivers and pit crew are restricted to handling only their car. PLEASE DO NOT TOUCH ANYONE ELSE’S CAR. Only officials and current heat drivers are allowed in the track area. DO NOT RUN in the race arena, nor touch the race track, nor any of the flags, banners, or pylons. Report to the pit area when your car number/name is called. Enter the track area and place your car at the starting gate when instructed to do so by a race official. Once your car is at the starting gate, WALK to the pick up area at the finish line. Once the heat is complete and a race official has instructed you to do so, pick up your car and return it to the starting gate for the next heat if you are called again. At the conclusion of the race, return your car to it’s designated spot on the staging table. Preparation of the car body, usually the funnest part of the project, should be done first. For speed, it is most important to use auto shop sandpaper to remove any burrs from the metal axles, then smoothing each axle with a finer grit sandpaper(s) and finishing with a fine alumina polish (available at hobby shops). The axles and wheels should be installed last, after body prep. Wheel alignment is also very important. Make sure the axles are installed in parallel so that the car rolls straight. Test how straight the car rolls on a clean flat surface before making adjustments.